I consider the porterhouse to be the king of steaks. 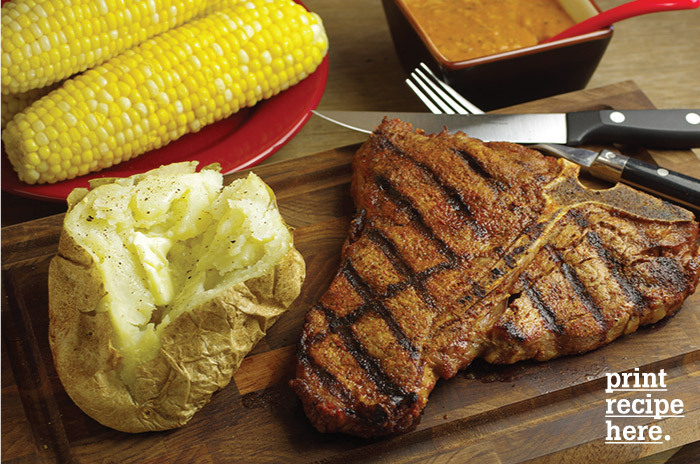 It’s a big manly steak that’s always cooked on the bone. Cooking a steak on the bone not only gives it big flavor but a great look as well. And, of course, the bone makes for a nice doggy bag. On one side of the porterhouse is the wonderful full-bodied taste of a New York strip steak and on the other side is the luxurious tenderness of a filet mignon – the best of both worlds. 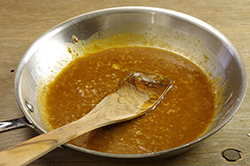 The steak sauce in this recipe is a great match for the porterhouse, but can also go well with any other cut of steak. These would go very well served with a baked potato and creamed corn. 1. 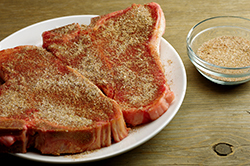 Season the steaks liberally on both sides with the Big Bold Steak Spice. Refrigerate. 2. 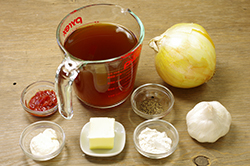 To make the sauce: Pour the beef broth into a medium saucepan over medium heat and cook for about 15 minutes, until reduced by half. Set aside. 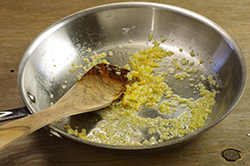 In a medium skillet, over medium heat, melt the butter. 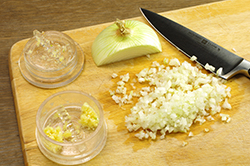 Add the onion and garlic and cook for about 5 minutes, stirring occasionally, until the onion is soft. Add the flour and mix well. Cook for 2 minutes, stirring once. Add the reduced beef broth and mix well. 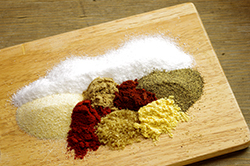 Add the horseradish, chili sauce, and pepper and mix well. Bring to a boil, reduce to a simmer, and cook for 3 minutes. Transfer to a bowl or a gravy boat and set aside. 3. Prepare the grill for cooking over direct heat. 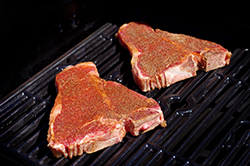 Place the steaks directly on the cooking grate. Cook for 4 minutes. Flip and cook for another 3 to 4 minutes for medium-rare, or to your desired degree of doneness. Remove to a platter and let rest for 4 minutes. Serve with the steak sauce on the side.